Abu Dhabi: There are few things that Stephane Peterhansel has not achieved in cross country rallying, although winning an event with his wife for company, now a real possibility in the Abu Dhabi Desert Challenge, would be another first. It is eight years since the Frenchman won the last of his five Desert Challenge cars titles, but he has another in his sights, despite recording only the fourth fastest time on Monday’s 222.80km Al Ain Water stage in a Mini John Cooper Works Rally as another sandstorm pounded the Rub Al Khali. While Saudi Arabia’s Yazeed Al Rajhi left behind the previous day’s disastrous transmission problems to win the stage in a Toyota Hilux Overdrive, Peterhansel ended it with a lead of two minutes and 26 seconds over Dutchman Bernhard Ten Brinke. Right up until the eve of rally there were doubts as to whether Peterhansel’s wife Andrea would join him in the car because of travel sickness issues, something which never troubled her as a top-class rider and driver. They faced a fresh challenge on Tuesday, after Ten Brinke’s Toyota and the Mini JCW Buggy of overnight leader Cyril Despres joined a trail of casualties to get stuck in soft sand, leaving them out in front with only the dunes ahead. “It was a complicated stage and we saw a few cars ahead struggling and getting stuck, so we played it safe and went not too fast,” said the 13-times Dakar Rally winner at the end. With a fragile lead, Peterhansel has a pack of proven winners at the top level hounding him. Just 32 seconds behind Ten Brenke comes the UAE’s 2017 winner Khalid Al Qasimi in the Abu Dhabi Racing Peugeot 3008 DKR. 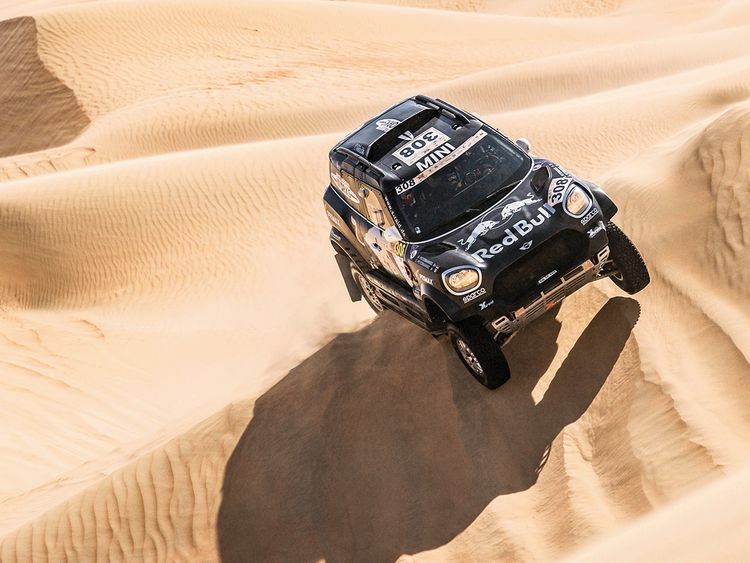 Completing a top six separated by only 16 mins 20 secs are Poland’s Dubai Baja champion Jakub Przygonski of in a Mini JCW Buggy, last year’s Czech winner Martin Prokop in a Ford Raptor RS Cross Country and Russia’s two-times Desert Challenge victor Vladimir Vasilyev in a BMW X3. It was another particularly testing day for the bike and quad riders as 30km winds churned up the sand, making visibility difficult, and Spain’s Jose Cornejo on a Honda adapted best. Not only winning the stage by 1:43 from Spanish Honda teammate Joan Barreda Bort, he covered it 5:55 faster than Sam Sunderland to slash the 2017 Desert Challenge champion’s overall lead on a KTM to 51s. The Argentinian Benavides brothers Luciano and Kevin, along with UAE-based South African Mark Ackerman complete the top six. “We’ve had another day of classic desert rallying and with so many top riders and drivers close together the race for the cars and bikes titles is really wide open.” said Mohammed Bin Sulayem, President of the Automobile and Touring Club of the UAE and FIA Vice President for Sport.